From 50 yards and in, no golfer in history has demonstrated more talent, flair, creativity and precision, or generated more raw excitement, than Phil Mickelson. His ability with the sand wedge and putter are legendary not only among fans but his peers as well, and it is his skill with those clubs that is primarily responsible for his winning 34 tournaments on the PGA Tour, including three major championships. In his first-ever instruction book, Mickelson explains in detail how to master every phase of the short game. 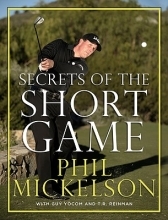 Mickelson maintains that any golfer of average ability can become a deadly short-game player by approaching the subject with a blend of science (proper mechanics and setup) and art (imagination and feel). Mickelson does a fine job explaining both; combining the wisdom of his great teachers with his own fertile imagination, cultivated from 34 years of experimentation, trial and error. No golfer can afford to miss out on Mickelson's secrets and tips.